Skill Wraps give you quicker, stronger hands for better puck control. And, Skill Players don't have to be afraid of slowing their hands down with resistance training, you will get your hands back to "normal" or "game ready" after each workout. Place Skill Wraps on a hockey stick to strengthen the top hand and the bottom hand, as seen in the picture below. Proportionally heavier weights are put just below the top hand and proportionally lighter weights are put just below the bottom hand. By placing the Skill Wraps on your stick this way you create a balanced feel. Although, you may have to adjust the weights to get just the right balanced feel. It's best to workout with two hockey sticks, one stick with Skill Wraps on it and one without. For Step 1 put Skill Wraps on your Stick. 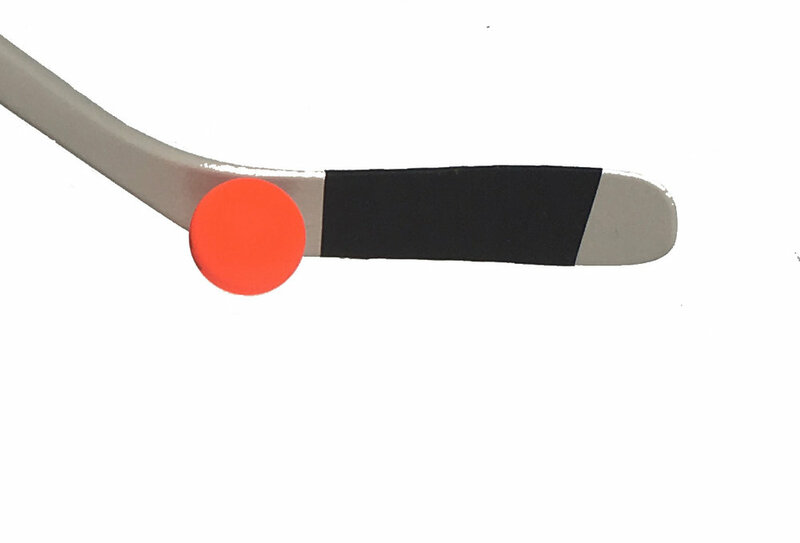 Stickhandle, shoot or pass pucks and balls going from heavy to light. I know hockey players do not practice stickhandling this way. I broke the process down for educational purposes. Once you understand the process you can adapt it to your own goals and style. Start with the weighted orange puck, stickhandle it for 60-75 seconds. Work on the fakes, moves and dekes you already have. When switching objects to stickhandle your hands may take 5-10 seconds to adjust. This is a normal part of the process. Learn to relax your hands! 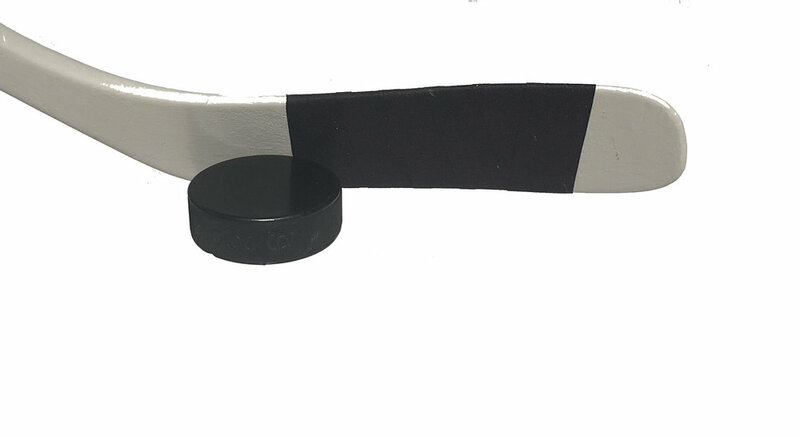 Next use the normal black puck, it's normal because that is what you will use in a game. Again, stickhandle it for 60-75 seconds. Work on the fakes, moves and dekes you already have. Now use a blue puck or a roller hockey puck. Again, stickhandle it for 60-75 seconds. Work on the fakes, moves and dekes you already have. When switching objects you are stickhandling your hands may take 5-10 seconds to adjust. This is a normal part of the process. Now use a light fast street hockey ball. Stickhandle it for 60-75 seconds. Work on the fakes, moves and dekes you already have. When switching objects you are stickhandling your hands may take 5-10 seconds to adjust. This is a normal part of the process. Learn to relax your hands!! For Step 2 use a stick without weights on it. Start with the weighted orange puck, stickhandle it for 60-75 seconds. Work on the fakes, moves and dekes you already have. When switching objects to stickhandle your hands may take 5-10 seconds to adjust. This is a normal part of the process. Learn to relax your hands and arms! Next use the normal black puck, it's normal because that is what you will use in a game. Again, stickhandle it for 60-75 seconds. Work on the fakes, moves and dekes you already have. Learn to relax your hands if you feel like you are under or over stickhandling objects, it's normal. Now use a blue puck or a roller hockey puck. Again, stickhandle it for 60-75 seconds. Work on the fakes, moves and dekes you already have. When switching objects you are stickhandling your hands may take 5-10 seconds to adjust. This is a normal part of the process, relax your hands and arms. Now use a light fast street hockey ball. Stickhandle it for 60-75 seconds. Work on the fakes, moves and dekes you already have. When switching objects you are stickhandling your hands may take 5-10 seconds to adjust. This is a normal part of the process. Learn to relax your hands and arms!! GET YOUR HANDS BACK TO "NORMAL" or "GAME READY." This is a very important step! You have to get your hands back to quick and fast, otherwise you will slow your hands down. For Step 3 use a stick without weights on it. You will be going from light, fast stickhandling objects to light stickhandling objects, then, to a black puck. Repeat this process until the black puck feels normal. Each time you come back to the black puck it will feel heavier and slower. I know hockey players do not practice stickhandling this way. I broke the process down for educational purposes. Once you understand the process you can adapt it to your own style and goals. Stickhandle a light fast object. It could be a street hockey ball, golf ball, a Wooden Swedish Snap ball, just so that it is very light and fast. Stickhandle it for about 60-75 seconds. Stickhandle a light object. It could be a blue puck, roller hockey puck or tennis ball, just so it is lighter and faster than a black puck. Stickhandle it for about 60-75 seconds. Now, check your hands out to see if they feel like they are back to normal. 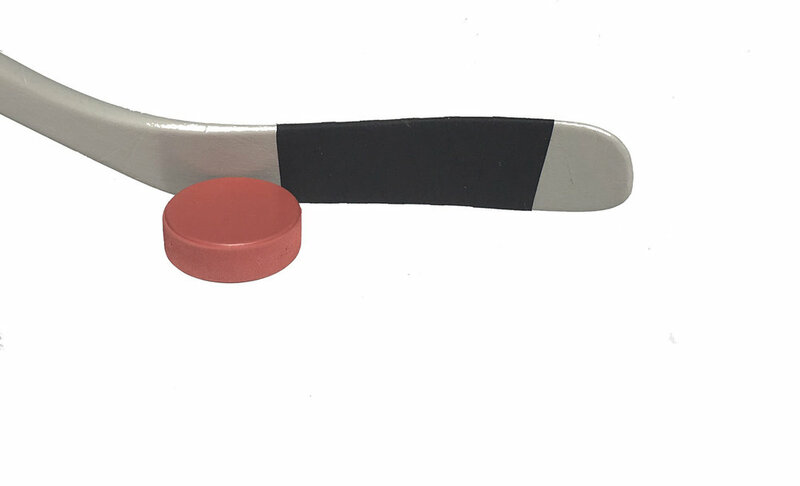 Stickhandle the black puck, it should feel heavier and slower. If your hands feel like they are back to normal you are good to go. If not, repeat the process from above until your hands are back to normal. Light, Medium or Heavy Resistance Workouts anytime of year... it's up to you, how good do you want to be? Hockey players can use Skill Wraps for resistance training during the season and the off season, Players can customize their workouts anytime of year. You don't have to wish you could have good hands anymore! 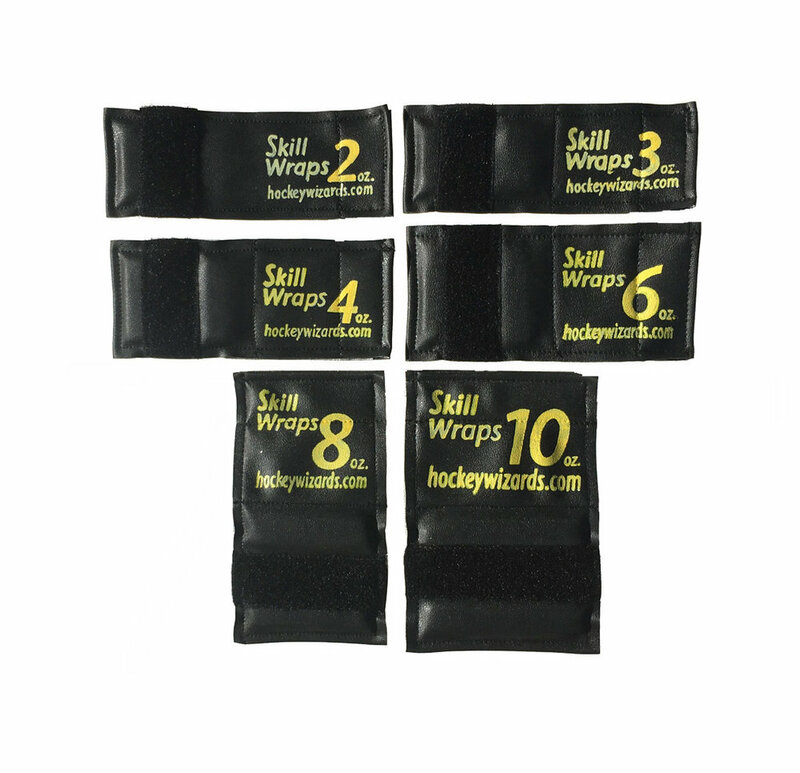 Skill Wraps will prepare your hands for tryouts or training camp. You don't have to play them into shape anymore. Skill Wraps give you the choice to warm up for a game with light weights. Skill Wrap workouts will maintain and improve your stick skills during the season with light to medium weights. Skill Wraps will improve your stick skills quickly during the off season with heavy resistance workouts! Skill Wraps will improve all your stickhandling, passing and shooting skills, your current moves and develop new moves faster. Stress your hands with Skill Wraps to get: quicker hands, stronger hands, softer hands, and better conditioned hands. Your confidence will grow as you feel and see your hands improve with Skill Wraps! Get the HANDS you always wanted!! Get Skill Wraps today and start improving all your "SIC" stick skills!!! 1. Find the yellow dashed line on your Skill Wrap and place it on the bottom or top of your stick. 2. The two weights or lumps should go on the sides of your stick. 3. Then tightly wrap the Skill Wrap around your stick shaft and close it using the Velcro. Skill Wraps stretch and have a tacky feel to them. For light stickhandling workouts they should stay in place on the shaft of your stick. 1. Put the Skill Wrap on your stick first, then put the Wrap Stopper on just below it. 2. Tightly wrap the Wrap Stopper around your stick! Wrap Stoppers keep Skill Wraps in place on a hockey stick shaft for intense shooting, passing and stickhandling workouts. Skill Wraps do not slide down the shaft of a hockey stick, at all, when Wrap Stoppers have been applied. Skill Wraps go on a hockey players stick for customized resistance training workouts on ice or dryland. Skill Wraps can be used in a variety of combinations on a hockey stick to customize resistance training workouts, for almost every age, strength or skill level. Skill Wraps can be used for light, medium or heavy resistance training workouts. Skill Wraps mimic weight training and you will get your hands back to "normal" or "game ready" at the end of every workout! Click on the buttons above to watch player reviews.